Thanks to a Northern New York Library Network Technology Grant, CEFLS is piloting a public library-led history, storytelling, and local cultural heritage program for rural communities which was created by Historypin.org. The program is called Storybox, and it offers a kit-based program which makes it easy to facilitate a storytelling program in a library or other cultural organization. Participants share short stories related to home and community with each other, then expand on them in a group, finally committing the most compelling stories to paper and contributing to a display. 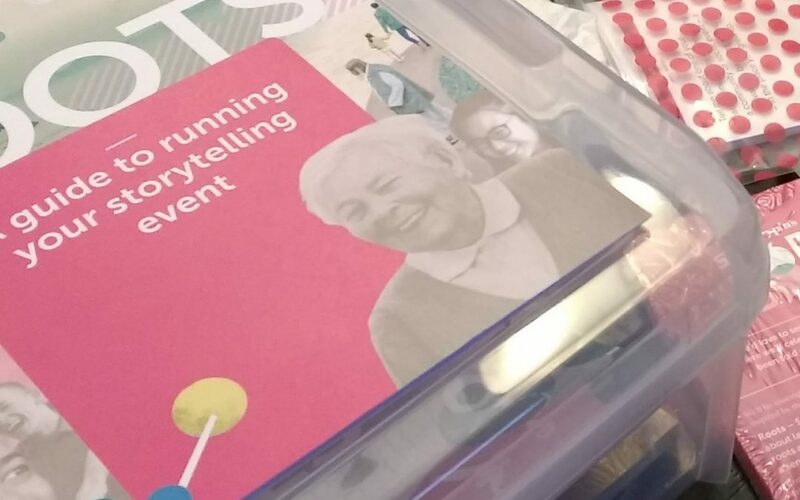 The professionally designed and tested materials in a Storybox include a facilitator’s guide, story starter cards, and question dice to help participants draw each other out. In the past few months, we have held “train the trainer” sessions with library directors and volunteers. The training sessions consist of running the program to show how it works – each time we’ve done it we’ve been amazed at how interesting and compelling the stories and conversations are. Some of the topics of local interest have included mealtime traditions of a French Canadian family, personally rebuilding a local hydroelectric dam, growing up in a small neighborhood near Plattsburgh in the days when children were free to roam (within limits), experiencing the merger of two Catholic schools, and going to the Franklin County Fair. The goals of the Storybox program include capturing local stories, but also building community and valuing diversity. We have already seen and experienced the positive effects in the training sessions, even as people who know each other learn new things about their partners. Several libraries are planning to hold their own events in the near future. A final phase of the project will be capturing some of the stories told in digital form, either by scanning participant’s photos and documents or recording short oral histories. With permission of the storytellers, these digital objects will be contributed to the Historypin website, where they can be placed in geographical context and may be appropriate for inclusion in the New York Heritage collection as well. Betsy Brooks is the Automation and Technical Services Librarian at the Clinton Essex Franklin Library System. About CEFLS: The Clinton Essex Franklin Library System is a non-profit federated library system serving 33 public libraries and reading centers in Clinton, Essex, and Franklin Counties. The System was the first multi-county system in New York State, established in 1954 by joint resolution of the Boards of Supervisors of Clinton and Essex Counties. Franklin County joined the federation in 1962. The Library System was chartered by the Board of Regents of the University of the State of New York on June 25, 1954, and is one of 23 public library systems serving the state.